The wall was to high, as you can see. I made the connection long ago. Pink Floyd was right. Fun with guitar. This is very impressive, though in some sections he does knock off the easiest part of the song. But the easiest part happens to be the part people recognize. … you shone like the sun! Well, that was a confusing space odyssey Friday. So the asteroid DID hit us, right? This was a meteor. The asteroid is still out there. Still not a danger. In fact, by Friday afternoon, it had passed by unnoticed and was on its merry way. This was something else, and we didn’t know it was coming. So the meteor was a sliver of the asteroid that broke off, right? It was a day when the Earth was caught in a cosmic crossfire. The big rock came from the south, the smaller one from the east. They were unrelated objects, with different orbits, one the size of an apartment building, the other slimmer but with better aim. The larger asteroid missed by 17,000 miles, as expected, but the Russian meteor stole the show Friday, fireballing across the Ural Mountains in spectacular fashion and exploding into fragments, creating a powerful shock wave that blew out windows, collapsed roofs and injured 1,200 people, mostly from broken glass. 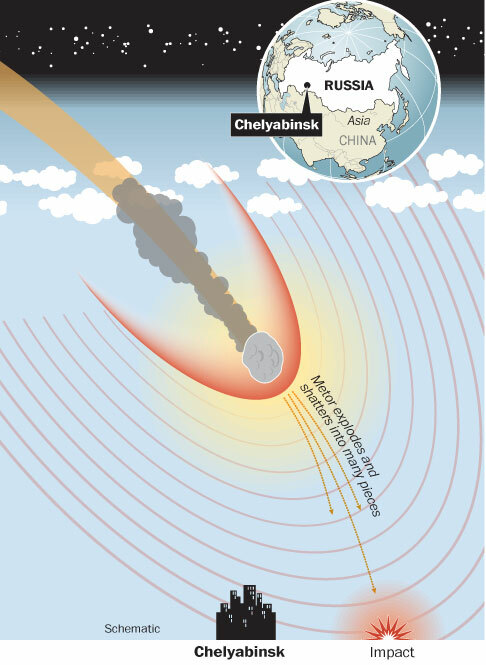 Here’s an illustration of how the meteor came down when it hit Russia. It was traveling at 40,000 miles an hour. It was about 50 feet wide and weighed about 7,700 tons. It exploded high in the atmosphere with the force of 20 to 30 Hiroshima-size atomic bombs. Do you remember the 1950s science-fiction “Uh oh! Here comes the killer asteroid” movies, where a group of scientists have built ONE SPACESHIP to take a couple of hundred people to another planet — that just happens to support human life — so the species will survive. Thing is, unless we’ve missed the announcement, there’s nowhere to go. If there was a planet in range that would assure our survival, we’d be sending probes there already. NASA launched the two Voyager spacecraft more than 35 years ago. They are literally at the edge of the solar system. Other satellites have examined the giant planets past Mars. We’ve got robots on Mars for now going on 10 years looking for minuscule signs of life. What they’ve found so far? Maybe there’s water on a moon of Saturn. Does anybody here remember Vera Lynn? Remember how she said that we would meet again some sunny day? Vera! Vera! What has become of you? Does anybody else in here feel the way I do?